With the upcoming Centennial of the Armistice that ended the Great War, Throwback Thursday will be showcasing photographs from the Great War period. 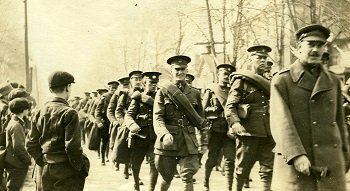 This photograph was taken sometime between 1914 and 1918 showing the 99th Battalion marching down Ouellette Avenue towards the train station to eventually head overseas to the battlefields of Europe. If you would like to view more photographs from the Great War period, please go to the Windsor Public Library’s digital exhibit “Windsor’s, History and Pictures” at http://heritage.windsorpubliclibrary.com/index.php.